Are you looking for an inexpensive gift that helps you share the true meaning of Christmas? 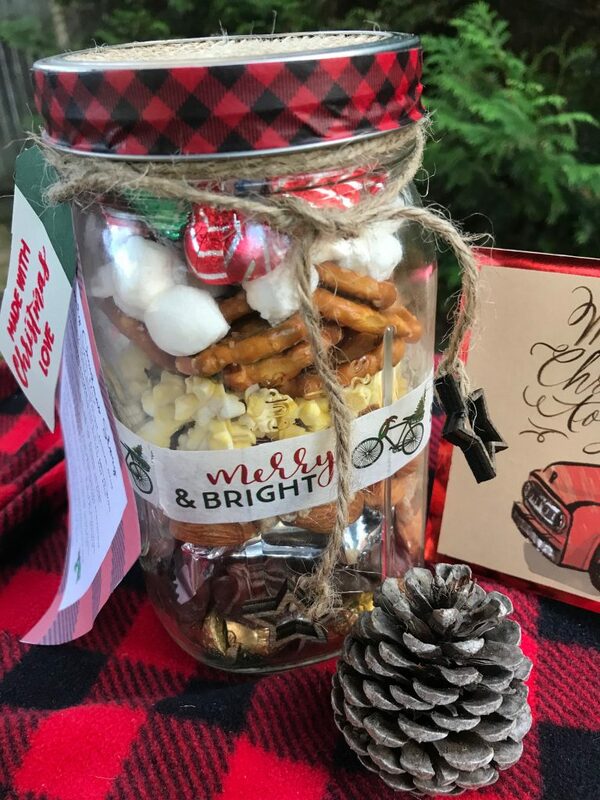 This Nativity Christmas Story Trail Mix is perfect as a mason jar gift or a treat to bring to your next Christmas get-together! I am super-excited to share this post with you today! First, I am not by any stretch the crafty, creative DIYer. I really wish I were, and to be honest, I am really working on it – but it’s not intuitive for me. So, this is my first sort-of DIY project I’m sharing. You might be underwhelmed – it’s pretty easy and not really that crafty at all, but I’m excited just actually to be doing it. And second, when I came up with the idea, I didn’t even want to look at Pinterest. Usually, the way it goes is that I come up with this ‘million dollar idea” and then, I look on Pinterest, and a million other people have done it. This happens All. The. Time. But guess what? My sister looked for me – and this is not anywhere else on Pinterest! A win for the little guy, right?!? To be fair, I was ‘inspired’ by something I saw on Pinterest, but what I’m sharing today is not on Pinterest. 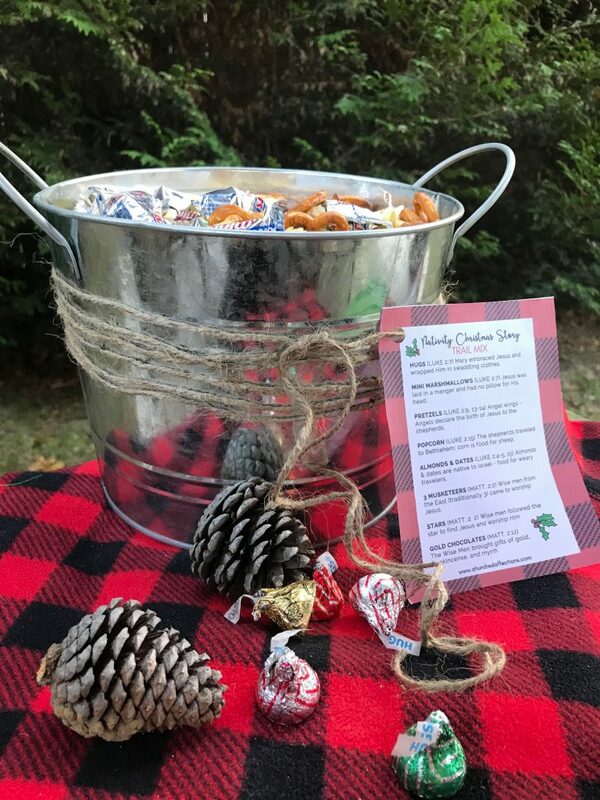 A few weeks ago, I happened upon a “Thanksgiving Mix.’ I have no idea who the original creator is, but there are bunches of versions on Pinterest. Basically, it’s a whole bunch of symbolic Thanksgiving treats that you put together in a jar as sort of a yummy trail mix. 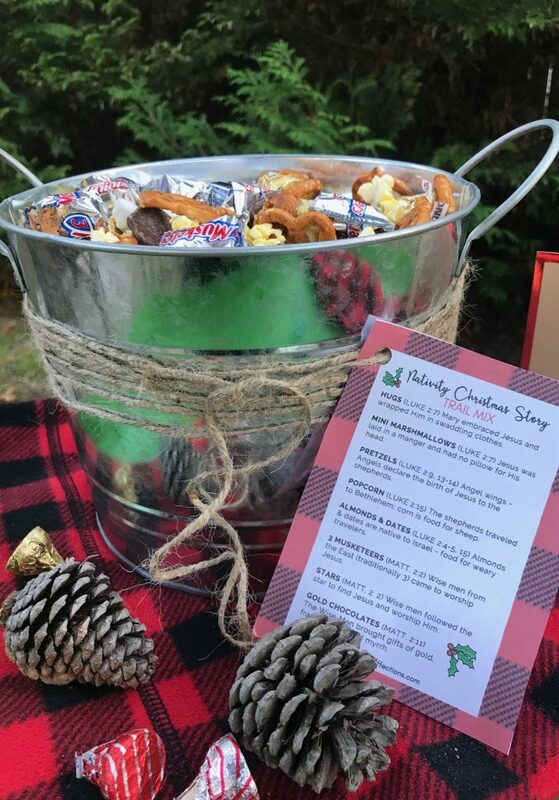 I thought, ‘I’d really love to do that for Christmas!’ So, after a bit of thinking, I came up with The Nativity Christmas Story Trail Mix. How great would it be to tell the Christmas story through food, right?!? 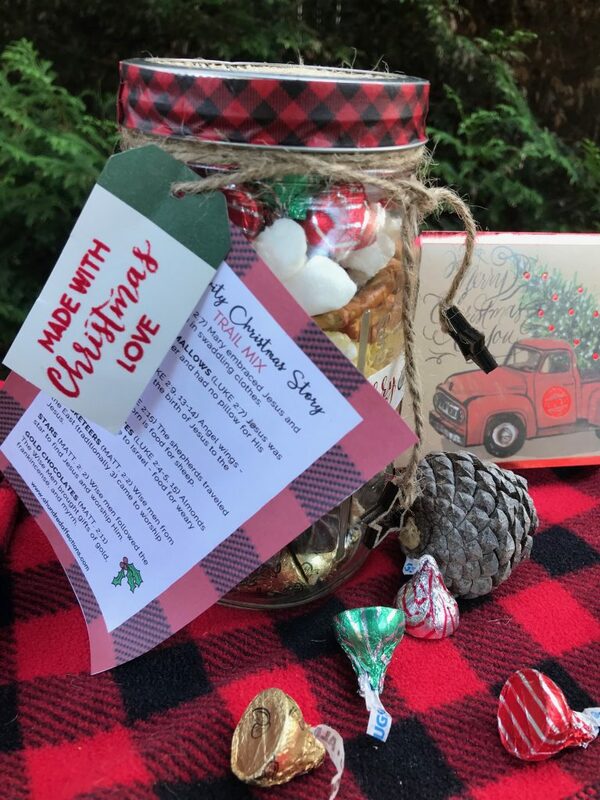 I’ve been all about mason jar gifts this year – and this is my own take on the mason jar gift – in addition to sharing the Gospel! 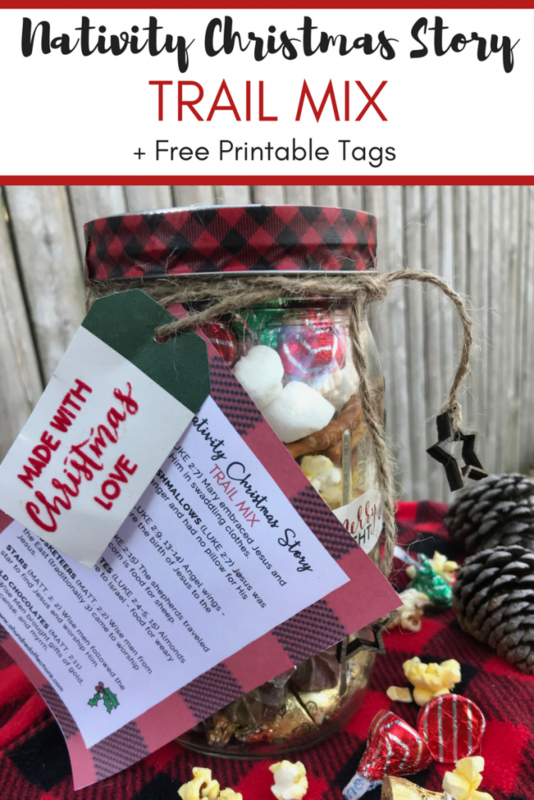 It’s perfect for teachers, coaches, bus drivers , hostess gifts, friends – and you can make this in bulk and keep the costs down! My favorite thing about this is that it keeps the focus on Christ and why we are celebrating Christmas. Sometimes, we don’t always get to share the Gospel with others, but this clearly identifies us as believers. Love that! This is also perfect just to have in big bowl for your family, cookie exchanges or Christmas parties. It’s a simple, easy snack you can bring that is festive and delicious! Below are the food ingredients and decoration materials, with links for your convenience. Popcorn – I just made my own with popcorn I already had, but you can buy it as well! Hershey Kisses with Almonds Gold Chocolates – You can use any chocolate or candy wrapped in gold – chocolate balls, chocolate coins. I even found knock-off peanut butter cups wrapped in gold at Dollar Tree. Any gold foil-wrapped candy will work. HUGS (LUKE 2:7) Mary embraced Jesus and wrapped Him in swaddling clothes. MINI MARSHMALLOWS (LUKE 2:7) Jesus was laid in a manger and had no pillow for His head. ALMONDS & DATES (LUKE 2:4-5) Almonds & dates are native to Israel – food for weary Mary & Joseph as they traveled to Bethlehem. PRETZELS (LUKE 2:9-14) Angel wings – Angels declare the birth of Jesus to the shepherds. POPCORN (LUKE 2:15) The shepherds traveled to Bethlehem; corn is food for sheep. 3 MUSKETEERS (MATT. 2:2) Wise men from the East (traditionally 3) came to worship Jesus. STARS (MATT. 2: 2) Wise men followed the star to find Jesus and worship Him. GOLD CHOCOLATES (MATT 2:11) The Wise Men brought gifts of gold, frankincense, and myrrh. To put it together, just layer it starting with the last item, the gold chocolates, and work your way up. Be sure to mix the dates and almonds together as one item. Also, put just one layer of each item and do not make them too thick. Otherwise, you won’t have enough room to fit in all of the ingredients. If you have a bag of each item, you will have PLENTY to make several jars and then have some leftover. It takes very little to make one jar. 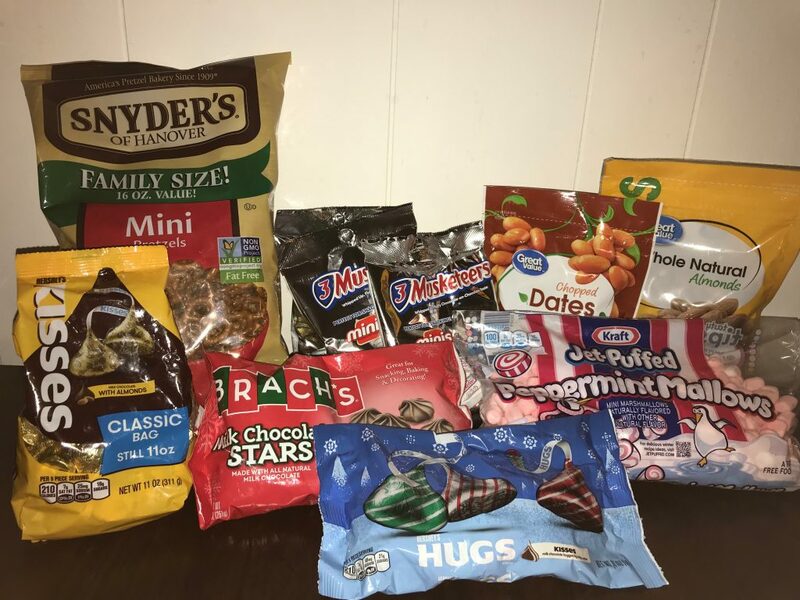 With the leftovers, I just dumped all the candy, almonds and dates into a big bucket, and then added enough pretzels and popcorn to balance out the rest. I threw in the mini-marshmallows sparingly, since most people don’t just pop marshmallows for snacks. You can totally customize how you dress up these jars to your personal taste! The washi tape, the gift tags, the ribbons – you really can create in a way that suits your style! 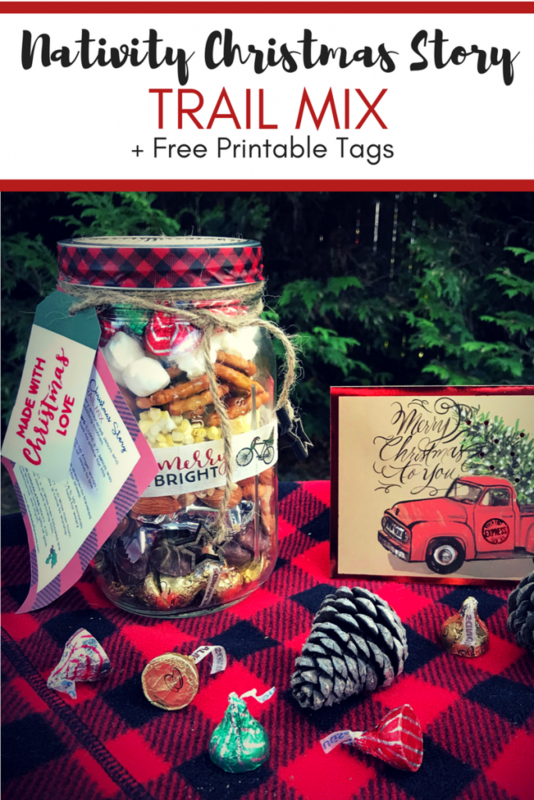 If you aren’t into the buffalo patterns, you can cut that off the gift tag printable and just glue the Trail Mix Story on a different background. Quart Sized Mason Jars: Make sure you get the quart-sized, not 16 oz. You will not be able to fit all the items in the smaller jar! 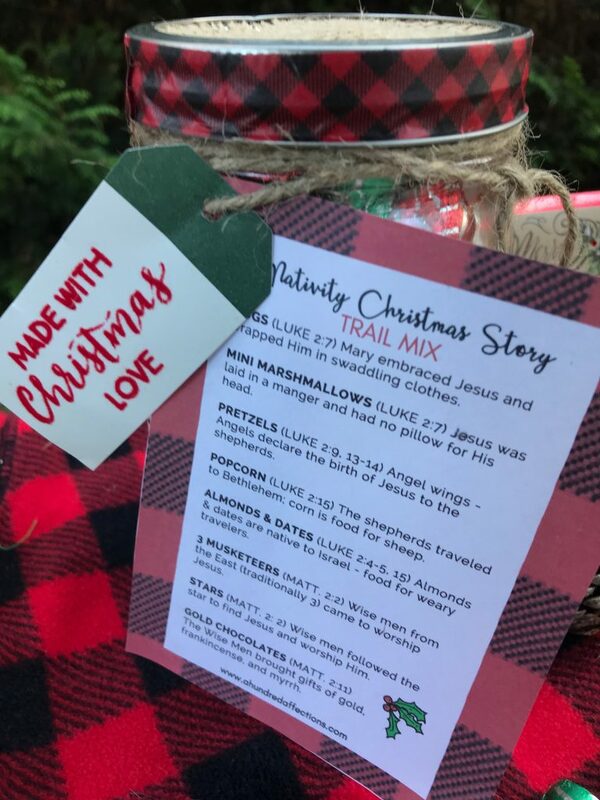 Nativity Trail Mix Tags: You can download the printable tag by filling out the box below! Print it out on cardstock for best results. It prints out 4 to a sheet. If you wanted to customize your look and didn’t want to go with the buffalo check border, I’ve also included a printable on just plain white paper, no border. Both are available when you fill in the box. Washi Tape: I found the buffalo print tape and the “Merry and Bright” tape for $1 each at the Bullseye Playground (dollar section) at Target. That section is hit or miss, but I’d suggest that area first. This link is another really pretty Martha Steward selection from Amazon for holiday washi tape. Michael’s or Walmart also have a nice selection. I wrapped the rim of the lid in one pattern of washi tape, and I used the other pattern to create a band around the jar. Wooden Stars: I also got the little wooden star ornaments at the dollar section at Target. I took the stars off of the twine that they came with and tied them on the ends of the jute string. You can use any small decorative items for the end of the strings, or they look great all by themselves! Jute String: This gets wrapped around the top to hold the Trail Mix tags and the gift tags, to give it that rustic look. You can also use bakery string if you like! I got my string at Walmart for about $2. They don’t sell it for that price online (larger quantity only online), but you can get similar jute string from Target for $3.00 if you wanted to order online. Burlap Ribbon: I put burlap ribbon on top of the jar. which I got at Dollar Tree. That is also hit or miss. You can buy the burlap ribbon here, or you can use scrapbook paper, a cupcake liner, or other burlap ribbon. Your choice! Gift Tag: I also bought a package of 6 gift tags from the dollar section at Target. Target has some other really beautiful gift tags to choose from! 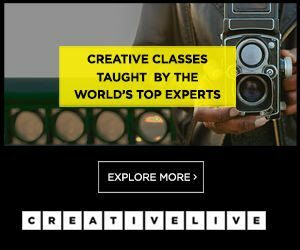 Like I said, I am definitely no mastermind when it comes to crafty projects, so, trust me – this is easy enough for anyone. And my favorite part is that while it is yummy and fun, it points back to the real reason for Christmas. This gift will let anyone know what you believe, and that is always the best thing, especially this time of year! If you create this, please let me know! I’d love to hear how it went! ***Be sure to check out the Ultimate Holiday Shopping Guide with over 70+ retailers! This is an updated guide with specials, sales, deals and coupon codes. This will be updated BLACK FRIDAY AND CYBER MONDAY! Yearning for some meaningful time with family? We have 40 Unique Advent Calendars with Free Printable with over 70 Advent Activities for you to do with your family! Need some help organizing your Christmas shopping? Download a FREE Christmas Shopping Planning Sheet. Just fill in the box below! I love this! So clever! And I had to chuckle when I read how you didn’t even want to look for it on Pinterest, only to be let down that it’s already been done. I run into that so much 🤦🏼‍♀️😖 so way to go!! I love clever ideas like this! Not only it is clever, but it sounds really yummy, too! Thanks for sharing this great idea! I can’t even stand how adorable this is!! I love it. 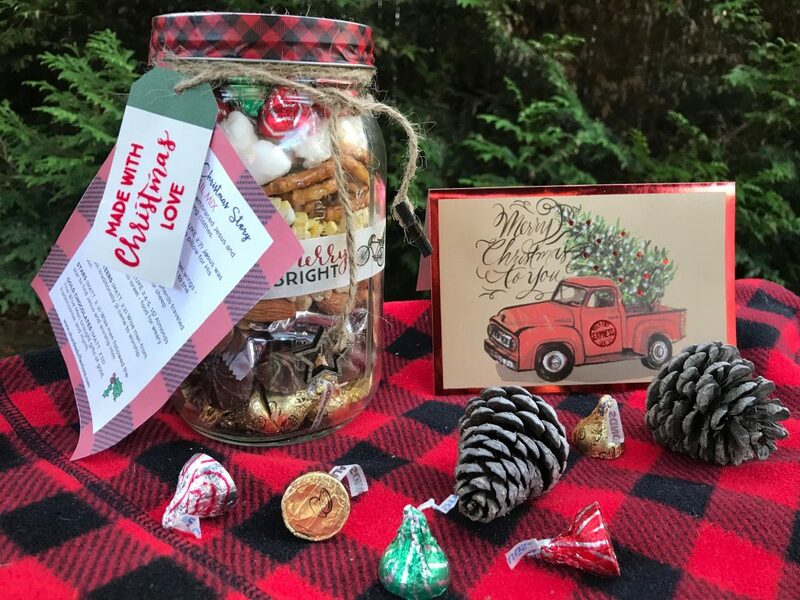 This is right up my alley—sharing the true Christmas story with symbolic treats. LOVE. Pinning. This is adorable! I love this idea. This is so cute and would be great for explaining the nativity in simple terms. Thanks for sharing! What a cute idea! I'm totally sharing these at our family dinner this year! What a great idea, Kate! You are so right on Pinterest. Happens all the time. I love this one though, and love that it is something that you came up with! 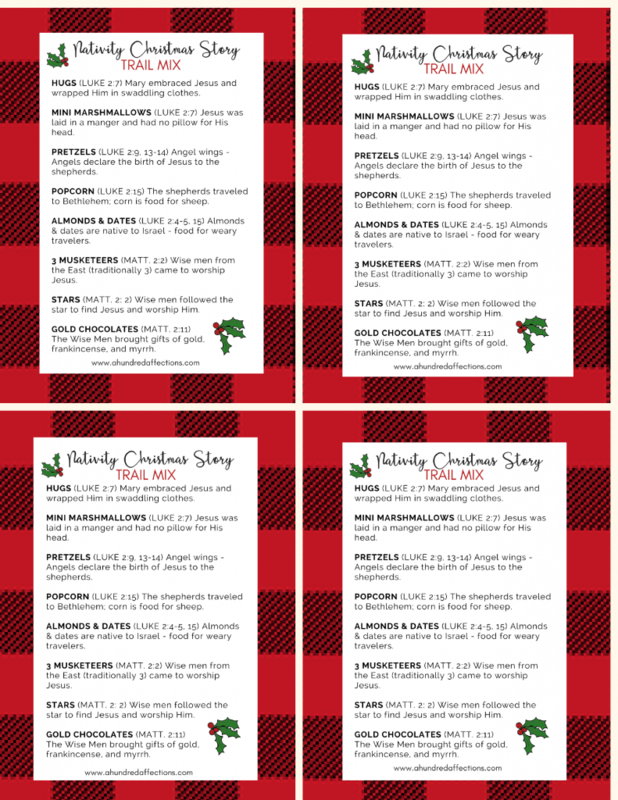 These would make great gift ideas or a really fun way to help teach kids about the Christmas story since they can help put it all together! I've pinned this so I'll remember it! Hope you have a great Thanksgiving and Christmas season! What a great gift idea! I love this, how creative are you?! I'm in the same boat, yearning for that creativity bug but not really having it. Long as we're having fun right? Pinned! Thank you! I'm so glad you liked it! 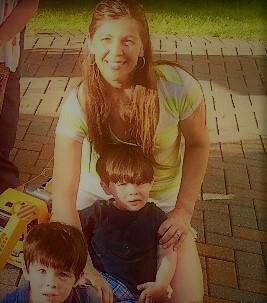 :) Thank you for coming by, Amanda!